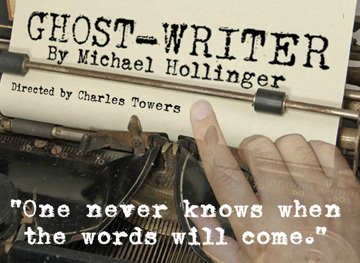 The season at Merrimack Repertory Theatre continues with "Ghost-Writer," a humorous, romantic mystery by Michael Hollinger. Directed by Charles Towers, the production is set to run April 19 - May 13. The theater is located in Liberty Hall at 50 E. Merrimack Street in Lowell. When twentieth-century novelist Franklin Woolsey dies mid-sentence, his long-time secretary, Myra Babbage, continues to write the story, claiming she's still taking dictation from the deceased author. Conflicts immediately arise between Myra, Vivian (the jealous widow), and other skeptics who believe that Myra is only finishing the novel for her own fame and fortune. So is she perpetrating a fraud, or does her insistent claim hold some truth? The company at Merrimack Rep will feature Rebecca Harris, Dan Kremer and Maureen Garrett. Hollinger says that the inspiration for "Ghost-Writer" came from an anecdote about Henry James and his secretary who typed his stories as he dictated them. As the story goes, the two became very close and when James died, the secretary claimed to continue receiving dictation from him. He commented, “My mother had died shortly before I encountered this story, and, through conversations with my father, I began thinking about ‘the presence of absence’-- that is, the power that a departed loved one holds over us, and how we negotiate the space left by that person." Hollinger's previous works include "Opus," "Tooth and Claw," "Red Herring," "Incorruptible," "An Empty Plate in the Café Du Grand Boeuf" and "Tiny Island." Among his honors are: the Steinberg/ATCA New Play Citation, a Mid-Atlantic Emmy Award, the Frederick Loewe Award for Musical Theatre, two Barrymore Awards, along with fellowships from the Independence Foundation, Mid-Atlantic Arts Foundation and Pennsylvania Council on the Arts. Patrons may purchase tickets, cash only, in person at the Box Office between 4:30 p.m. - 7:30 p.m. and name their ticket price. Following the performance, the audience is invited to stay for a Director’s Dialogue, where the director and designers field questions and describe how the play was staged. April 21 at 8 p.m. Audience members are invited to join Merrimack Rep’s staff and cast following the performance in raising a glass of champagne to celebrate the opening. April 25 at 2 p.m.
April 26, May 3, and May 10 at 7:30 p.m. Audiences are invited to stay after the performance to chat with the actors. For information and tickets, stop by the box office, call 978-654-4678 or visit MerrimackRep.org.